why are people, specifically in the hot rod world swapping to e85 gas. I see the slight cost difference but the energy released is not as much. so i see it as you need more fuel to do what gas does.. just wanna know why. i do get the lines ( gas is more corrosive for regular fuel lines ) and such and a few things have to be changed and adjusted .. I just don't see why swapping to it when you need more fuel to do what gas does .. Same reason people run alcohol. You can run lots of compression and lots of boost while the engine stays cool. It's some help running N/A and a lot of help when boosted. if you run e85 in an engine with low enough compression that the engine can be run on pump gas youll see very little benefit from e85 fuel use. 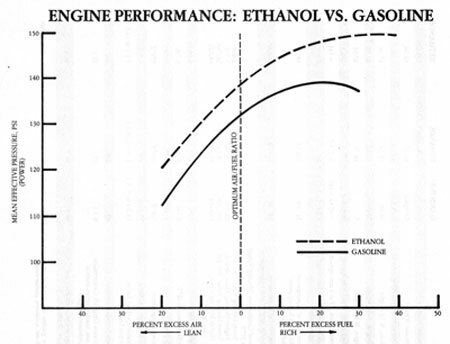 but ethanol and METHANOL both potentially can provide a significant boost in power if the engines built with a high enough compression ratio to take full advantage of the higher octane,or knock resistance the alcohol provides, yes it will require about 25%-30% more fuel , but the power potential is certainly available if the engines built with high mechanical compression, gains of 5%-10% or more in peak torque and horse power are rather easily made if the proper components and compression ratio are used to take advantage of the alcohols different burn characteristics and potential. the problem is that most engines are not exclusively designed to run ethanol. Edited by grumpyvette on 04-02-19 07:03 AM. Reason for edit: No reason given. At the prices around here there's no savings because of the extra fuel required. Your mileage will drop around 1/3. And it's not gas that's corrosive, it's alcohol. So with E85 you're at 85% alcohol instead of 5-15%. So it's more corrosive. The only advantage is more octane and the cooling effect of 1.5 times more fuel. Well now it makes sense .. especially the cr. On boost. Thnx for that insight ..